In the previous chapter (entitled Creating a Simple iOS 4 iPad Table View Application) we looked at the basics of the Table View object and worked through the creation of a simple example iPad application containing a single table view without any application navigation capabilities. Also discussed in the previous chapter was the fact that table view based navigation is primarily intended for use in iPhone applications and that it is more likely that a table view will be used within the context of a Split View and Popover based interface within iPad applications. The above caveats aside the goal of this chapter is to provide an overview of how to use the table view to implement navigation within an iPad application. The reason for including this in an iPad development book is two-fold. Primarily this is provided because a good understanding of the table view is needed to be able to implement split view and popover based interfaces on the iPad (a topic covered in some detail in the chapter entitled An iPad iOS 4 Split View and Popover Example). The second reason for including this information is the fact that there may well be instances where pure table view navigation on the iPad might actually be the right solution for your application. Navigation based applications present a hierarchical approach to displaying information to the user. 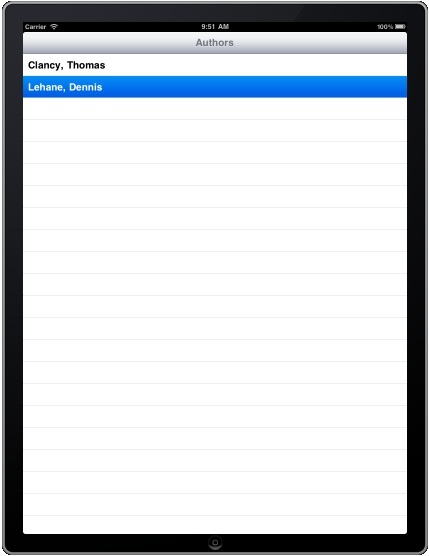 Such applications typically take the form of a navigation bar (UINavigationBar) and a series of Table based views (UITableView). Selecting an item from the table list causes the view associated with that selection to be displayed. The navigation bar will display a title corresponding to the currently displayed view together with a button that returns the user to the previous view when selected. For an example of this concept in action, spend some time using the iPhone Mail or Settings applications. When developing a navigation-based application the central component of the architecture is the navigation controller. In addition, each screen has a table view and a corresponding view controller. The navigation controller maintains a stack of these view controllers. When a new view is displayed it is pushed onto the navigation controller’s stack and becomes the currently active controller. When the user selects the button in the navigation bar to move back to the previous level, that view controller is popped off the stack and the view controller beneath it moved to the top becoming the currently active controller. 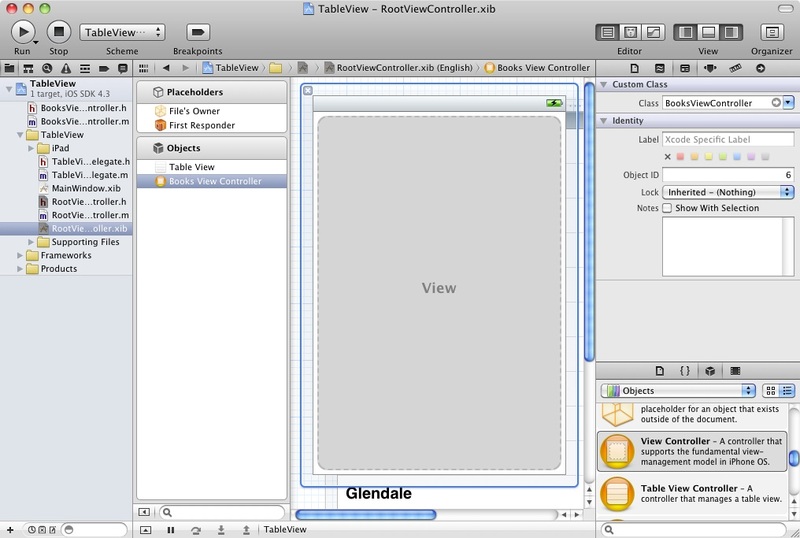 The view controller for the first table view that appears when the application is started is called the root view controller. The goal of the example outlined in the remainder of this chapter is to design and implement an iOS iPad application that combines both navigation and table views. When completed, the application will display a table view that lists book authors. When an author is selected from the table, a second table view will be displayed listing the books written by that author. The navigation bar on the books view will contain a button to navigate back to the list of authors. Since the objective of this chapter is to outline the steps involved in working with navigation and table views, rather than the handling of data, we will be implementing very simple code to create the authors and books data sources. In a real world situation it is more likely that such data would be pulled from a database, but in the interests of keeping this example as basic as possible we will be hard coding author names and book lists into simple array objects. In order to implement our example application a new project will be needed, so start Xcode and click on the option to create a new project. Select the iOS Application option from the left hand panel and highlight the Navigation-based Application icon from the main panel. On the next screen name the product TableView, click Next and choose a suitable location for the files before creating the project. The main Xcode window will appear populated with a number of different template files ready for us to begin to create our application. By default, Xcode assumes that the application is going to be running on an iPhone. Since we are targeting the iPad it will be necessary to change the target device setting. In the project summary panel change the Devices setting located under iOS Application Target to iPad and confirm the transformation in the resulting panel. 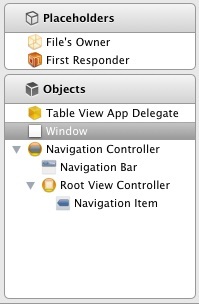 Xcode has created for us an application delegate and a navigation controller. The navigation controller contains a navigation bar and a root view controller for the home view of our application. 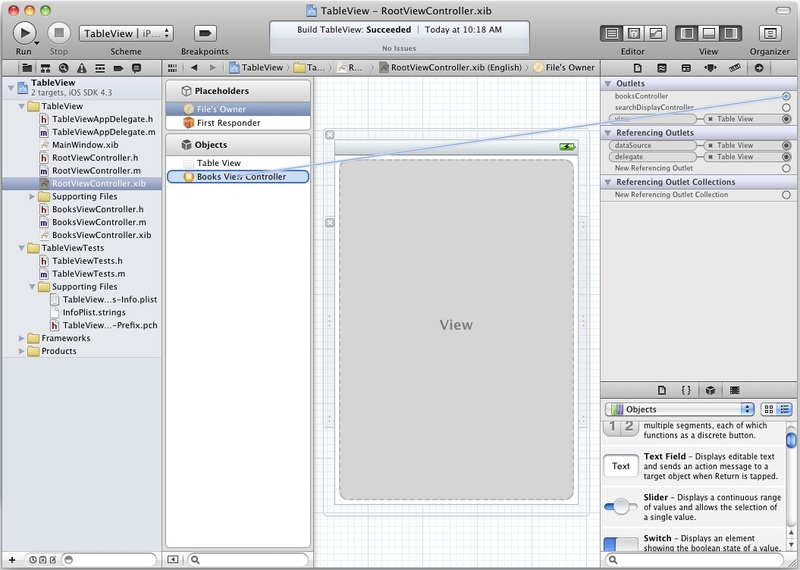 Though not visible in the above document window, the root view controller has associated with it an Interface Builder NIB file named RootViewController.xib (also automatically created for us by Xcode) that in turn contains a UITableView instance. To access this file, select the Navigation Controller item to display the design screen. This window will contain text that reads “Loaded from RootViewController”. Select the RootViewController.xib file in the project navigator panel to load the RootViewController.xib file into the editing panel where the table view will be visible. // Release anything that can be recreated in viewDidLoad or on demand. This line of code simply identifies the row that has been requested, uses it as the index into our array of authors and assigns it to the appropriate property of the cell object that was created for us in the preceding lines of the method. When we select an author we want to navigate to another table view that provides a list of books written by that author. That table view will have its own NIB file containing the table view object and also its own view controller. The next steps, therefore, are to create these two files and configure them to meet our requirements. To create the view controller for the table view that will display the list of books written by the selected author, Ctrl-click on the TableView entry in the project navigator panel and select Add -> New File. On the template selection screen, select iOS Cocoa Touch Class followed by the UIViewController subclass icon and click Next. On the next screen, select UITableViewController from the Subclass of menu and make sure that the Targeted for iPad option is on. We will manually create the NIB file later so also leave the With XIB for user interface option unchecked. Click on Next and save the class as BooksViewController. The next step is to create the NIB file for our second view controller. This will contain the instance of the table view that we will use to display the books that the selected author has written. In the main Xcode window, Ctrl-click on the TableView entry and select Add -> New File. In the New File dialog, select User Interface under the iOS list and select the View icon in the main panel. Click Next and make sure that the Device Family menu is set to iPad then click Next again. Save the file as BooksViewController. Select BooksViewController.xib to load it into Interface Builder. At this point, the file currently contains a UIView object when we actually want it to contain a UITableView. In the Objects panel, select the View icon and press the Delete key on the keyboard to remove it from the design. From the Object library panel (View -> Utilities -> Object Library) drag a Table View object and drop it in place of the deleted View object. The design window will subsequently update to reflect the presence of the table view, populating it with some dummy data. Select the File’s Owner icon, display the Identity Inspector (View -> Utilities -> Identity Inspector) and change the class to BooksViewController. With the File’s Owner item still selected, display the Connections Inspector (View -> Utilities -> Connections Inspector). Click on the circle to the right of the view outlet and drag to the Table View entry in the object panel. Select the Table View object and using the same technique, connect the dataSource and delegate outlets to File’s Owner. Now that we have the view controller and nib file for the books table view created we now need to implement the functionality of this view controller. Since the BooksViewController class is acting as the dataSource for the table view we need to add some code to store the names of the books written by the respective authors. In the above method we are using the title of the navigation bar to identify which author has been selected from the list (we will be implementing code to set the title in the root view controller later in the chapter). Based on this value we are initializing the array with the appropriate list of books. Finally, we make a call to the reloadData method of the table view to make sure that the new data is displayed (omitting this call will result in old data appearing). Next we need to modify our root view controller so that the books table view is displayed when the user selects an author from the list. When a user selects an item from a Table View, the didSelectRowAtIndexPath method is called so we need to override this method in our view controller. In this method we identify which row has been selected by the user and set the title property of the booksController object to reflect the corresponding author name. We then push the books view controller onto the navigation controller stack so that it becomes the currently active view controller, which in turn causes the books table view to become visible. Finally, build and run the application in the iOS iPad Simulator. Selecting an author from the first table view should cause the second table view to appear listing the corresponding books for the selected author.